And you know what…. it feels great. There I was on Wednesday morning. Panicking in traffic on the M25, crossing the Thames with the irregular outline of the palace against the sky to my right, parking the car, heaving bags and cases and presentation boards out of the boot, staggering through the security barrier. It was good to find that the old place hasn’t changed much while I’ve been away. But then it has been there for several centuries so I suppose it was unlikely to get up to much in a few months. The mellow brick, the clustered chimneys, the ring of the flagstones under my feet as I walk through the dim corridors, the smell of woodsmoke from the Tudor kitchen as it gears up for the day’s visitors, the way the light falls in the courtyards – all still the same, all still wonderful in the pinch me I can’t quite believe that I’m here way. I’m happy to be back again. What is different is that, when I climb the stairs up to the KLC studio, the sign-in list by the door has got eight names on it rather than eighteen, and the faces when I go in are new and different. Annie is there for the Crane Park presentations, but no Humaira. Instead Juliet and Philippa and a new bunch of fellow students to get to know. It doesn’t take long though. We’re all in the same boat. 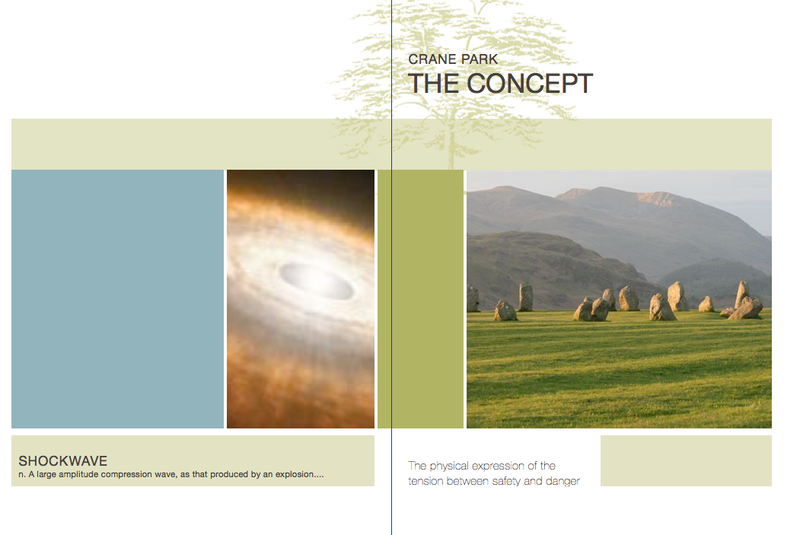 So at last I got to present the dreaded Crane Park Project and hand in the dreaded Construction File. And I’m so glad I did. Because they were both a huge amount of work – and I’ve been hard at it since Christmas finishing off what I started in the summer – so it would have been an awful waste of time not to hand them in and…. get them marked. Hmmmm…. that’s the bit yet to come. Not looking forward to that bit quite so much. Still it’s done. And it’s a great feeling to have got the other side of both projects. Because you know something…. I’m feeling really pleased with myself. Because in the course of doing these godammned, are you kidding me, you cannot be serious, this is a crazy amount of work, projects, I found out that I’m capable of an awful lot more than I ever thought. Which is what this course is all about. So for starters there’s Vectorworks, the movie. Well not actually a movie, it’s a computer aided design package thing. Which when I started out was like trying to learn a foreign language, where nothing made sense, and when I did learn how to do even the most basic thing I had forgotten it by the following day. Well you know something – I did sixteen construction drawings with it. And used it in the Crane Park project to draw up an admittedly basic plan. And I discovered how great it is for doing planting plans. I didn’t do all the fancy stuff that some of the others did to such great effect. But hey I’m an old dog learning new tricks. What do you expect? Then there’s Sketchup. Another computer design tool that had me a bit stumped. But hurrah for Sketchup for Dummies. So aptly named in my case. Because I used it to help me with my 3d perspective sketches. And it was a bloomin’ miracle. See…. 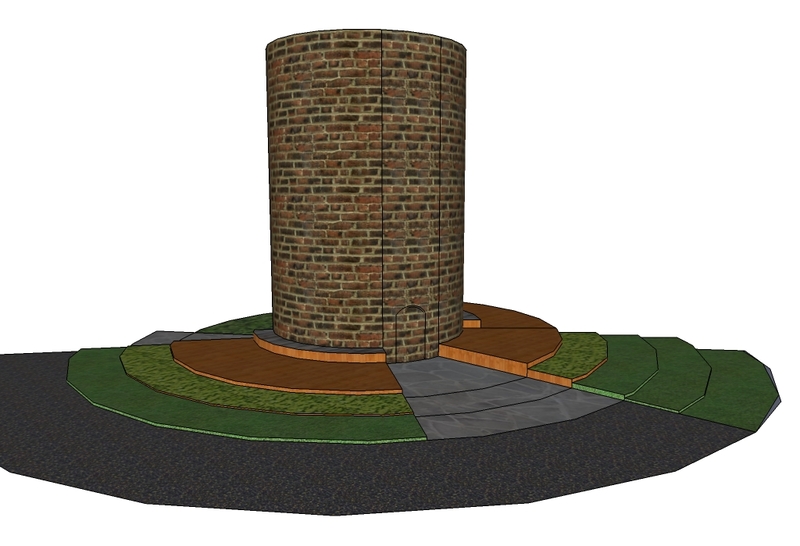 This is a very basic rendering of my plan – which was based on the Shot Tower at Crane Park as the centre of an explosion with shock waves radiating out from it. 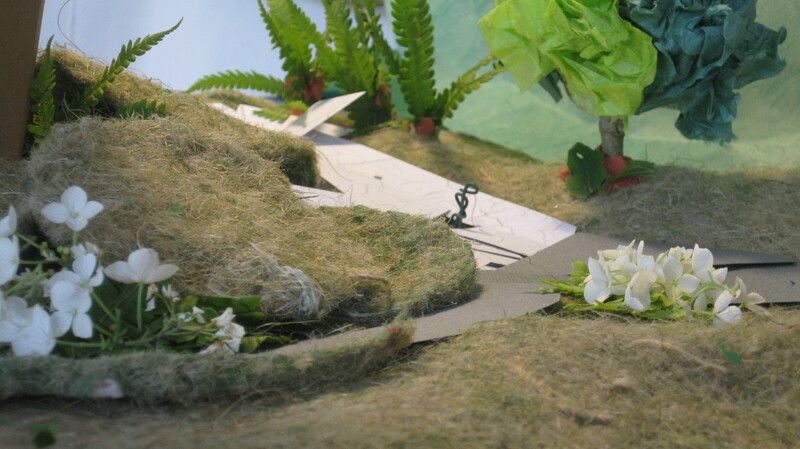 The other thing I did which I have never done before was make a model. This was the thing that finished me off in the summer. But luckily I took photos before I chucked the whole thing in the bin. So I was able to use it in my presentation this week. Compared to the models that some of the others made – particularly Delphine’s which was a thing of absolute beauty – mine was…. well pathetic would be a fair description. But I did it and it kind of showed me something about the site and my idea. So not a complete waste of time. 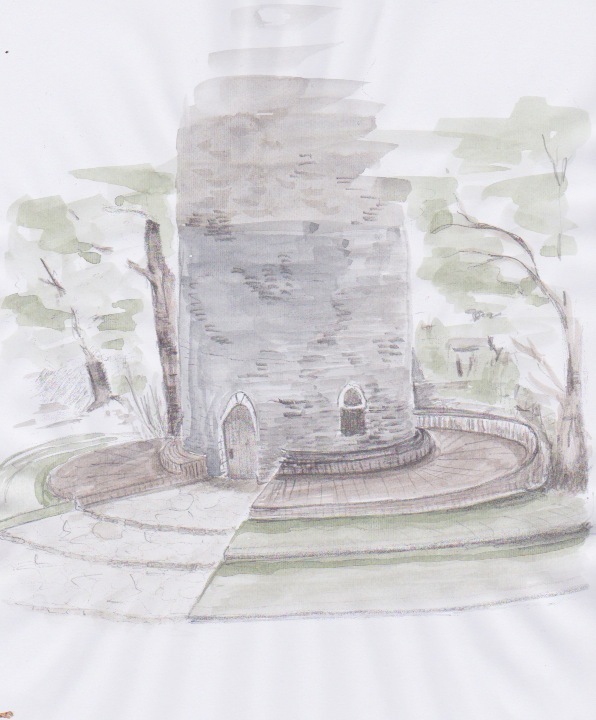 And there were the watercolour illustrations of my concept. And the sketches of my ideas for the burnt wood bridges and benches and fences throughout the site. And then there was ‘The Dossier’. The leave behind folder to go with the presentation. I used Ipages to do it. That’s Ipages to the uninitiated. I hadn’t heard of it either. It’s a wonderful tool for pulling together images and words. And it allows you to put together a presentation which looks…. well see for yourself. When I gave up work fifteen or so years ago we were still handwriting documents, giving them to our secretaries, who typed them up and gave them back to us. We corrected them, gave them back, and finally we had them in our sweaty little hands. But only words, no pictures. And no clever stuff like colour and different fonts and sizes and moving bits around the pages. So this is like magic to me…. So I’ve learnt a hell of a lot. And it all came together this week. And now we’ve got our next project. Which is an absolute peach. Because it’s at the palace. It’s the private garden outside the offices of the chief exec and other members of staff. How awesome is that. So hurrah for garden design. And boo to the old me who wanted to give it all up. There’s life in the old dog yet…. Fantastic stuff Jane! Really glad you’re back at the Palace and it hasn’t changed too much!! Hard to believe, but I actually miss the structure and discipline of the course. I was sooooo much more efficient with my time back then. Your Crane Park project looks great. Well done! Great to hear from you Phil. Hope life is treating you well. I’m really glad to be back but missing you all.